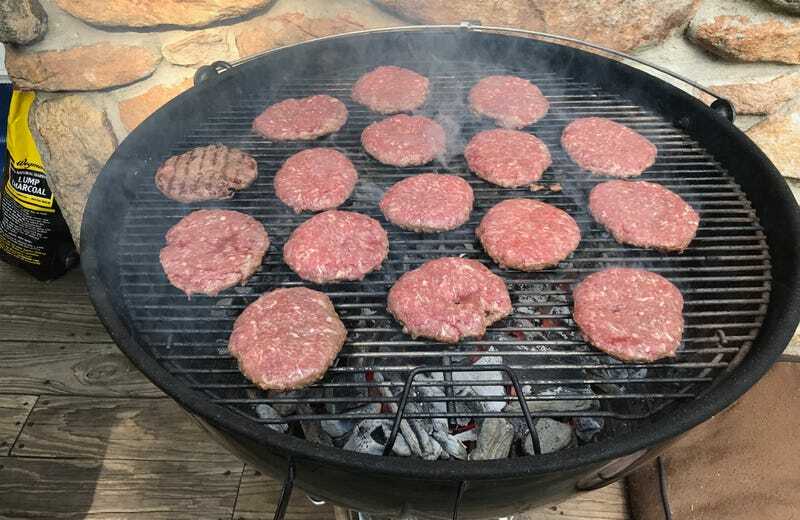 Here’s a dumb thing that grill chefs do: they flip the burgers on the grill, and then, while the burgers finish cooking, the chef lays slices of cheese on the top of the burgers, where presumably the heat of the grill will aid in the melting of the cheese. Don’t do this. It’s dumb! The cheese does not need a lot of heat to melt, and there will certainly be enough residual heat in the patties to melt the cheese when the patties go into the sandwiches. When you turbo-charge the melting process, all you wind up with is a burger with cheese that is melted too thinly over the top and is all folded up and congealed on the side of the burger. So you get a nice big cheesy bite of burger when you bite into the sides, but the middle of the burger—which should be the most delicious part—is shamefully cheese-less. And your damn grill is now covered in charred cheese scraps. Awful. Here’s another dumbass thing burger chefs do when they construct cheeseburgers: they put the cheeseburger cheese-side up on the bottom half of the bun, and then they pile lettuce and onions and pickles on top of the cheese, and then smash the top half of the bun down onto the whole deal. You moron! All that wet vegetation and those blobs of slick condiments make your burger a slick, sliding mess, and in all that sliding, the cheese is, again, pushed away from the top of the burger and onto the burger’s sides. Horrible. Here’s what you do: right before you pull the burger off the grill, put however much cheese you want onto the inside surface of the top bun; then pull the burger patty off the grill and lay it down onto the cheese; then load up the bottom bun with condiments and vegetation; then put the top half of the burger down onto the bottom half. Do you see? The cheese, as it melts, adheres to the porous top of the bun. There will be uniform cheese thickness across the entire burger, so that as you eat the burger you get the delicious creaminess of cheese in every bite, and a burger that doesn’t slip apart like a goddamn practical joke as soon as you lift it for a bite. You should test this theory this very day, by making some delicious cheeseburgers.